U.S. Federal Reserve Chairman Ben Bernanke on Tuesday appeared to back the White House’s efforts to stimulate the economy, saying aggressive action is needed now to avoid an economic calamity even as it adds trillions of dollars in new government debt. 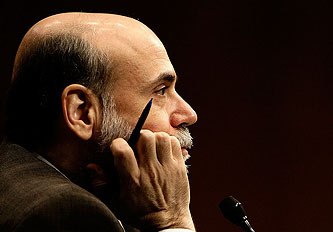 ….”By supporting public and private spending, the fiscal package should provide a boost to demand and production over the next two years as well as mitigate the overall loss of employment and income that would otherwise occur,” Mr. Bernanke said in prepared testimony to the Senate Budget Committee. If all goes well, that might be true. I wonder what the odds are of all going well?